Cashew nuts are a good source of protein, vitamins and minerals and can be included in a healthy, well-balanced diet. Like many foods, they should be enjoyed in moderation, as they contain a significant amount of calories and fat per serving. The type of fat in cashews, however, is healthy fat. Though cashews are high in fat, it is unsaturated fat, which is healthier than saturated fat.This type of fat can help lower blood cholesterol levels and reduce your risk for developing chronic diseases, such as heart disease. Cashews and other nuts are great sources of protein and make suitable substitutes for meat. Many vegetarians and vegans use legumes and nuts as the main protein source in their diets. In addition to protein, cashews contain vitamin E and the minerals phosphorus, zinc, magnesium and selenium, all of which are nutrients required for good health. One serving of cashews, equal to 1 oz. or approximately 13 cashews, provides 160 to 200 calories. Cashews are delicious enjoyed by themselves as a snack, and their sweet, buttery flavor makes them decadent enough to have as an appetizer when entertaining guests. Add them to yogurt or granola for breakfast, or sprinkle them on top of a salad for lunch or dinner. They can also be delicious as a stir-fry ingredient or in a cold pasta salad. Most natural foods, like nuts, can be part of a healthy diet if enjoyed in moderation. Though cashews contain unsaturated fat, which is healthier than saturated, they are still high in calories. 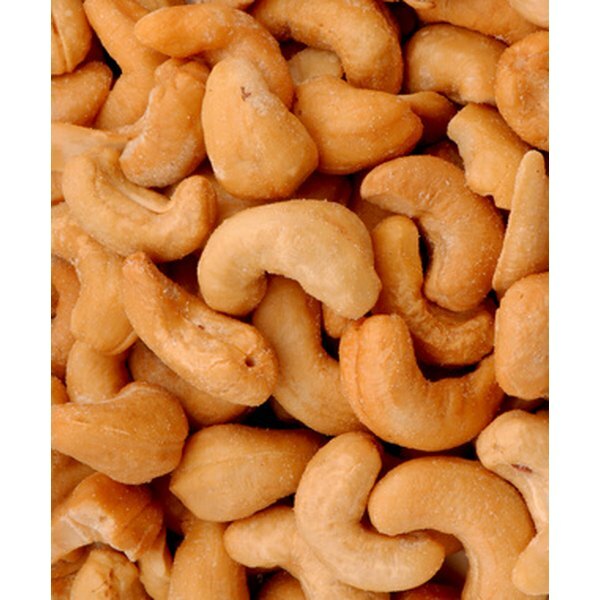 Eat cashews in moderation as they can still lead to weight gain through overeating, and choose plain, unsalted nuts. ADA: Does the Fat in Nuts Make Them Unhealthy? How Much Fiber Do Walnuts Have?